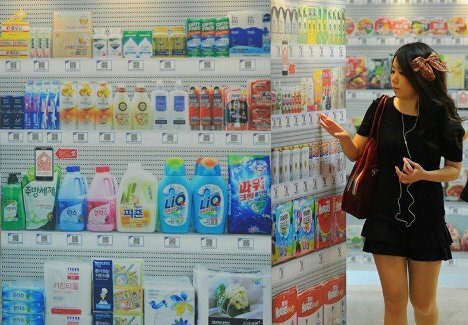 When Tesco opened a virtual supermarket on a subway platform in South Korea, it was a revolution in grocery shopping. Now they’ve teamed up with Samsung to open a more robust version of the same concept in Seoul. The store, in Seoulleung subway station, is larger than the original platform shopping stop but shares the same premise: pictures of products are posted with QR codes underneath. 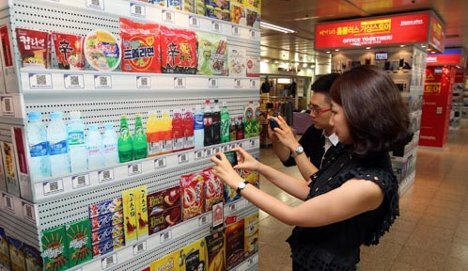 Shoppers use their smartphones to scan the QR codes of the items they want. See more in Futuristic or under Technology. April, 2012.